It is helpful to develop and use proper oral health care habits to keep your teeth looking strong and healthy. While most people know to avoid sugary foods, there are lots of everyday things that can damage their teeth that many people often may not think about. 1. The yeast and carbohydrates in bread are as damaging to the teeth as sugary foods. To make matters worse, many breads have even more sugar added. Choose whole grain options with no additional sugars. 2. While it is important to use good oral hygiene, brushing your teeth is a case where too much of a good thing can be bad for you by wearing away protective tooth enamel. Brush gently with a soft-bristled toothbrush just two to three times each day. 3. Do not use the teeth in place of appropriate tools. While most people know not to open bottles with the teeth, it is just as important to avoid opening softer packages with the teeth as well. This can wear down teeth and affect the jawbone and may result in problems with the bite and jaw alignment. 4. The next time you go swimming, try to avoid chlorine exposure to the teeth, which can weaken enamel. After swimming, rinse your mouth and gently brush your teeth. 5. Too frequent use of at-home tooth whitening products can weaken teeth and damage gums. 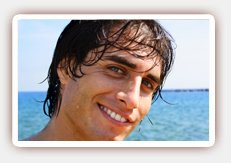 If you would like whiter teeth, speak with our dentist in West Hollywood to find the treatment that is best for you.